C. H. F. Peters discovered asteroid #200 Dynamene. J. Palisa discovered asteroid #569 Misa. A. Kopff discovered asteroid #668 Dora. G. van Biesbroeck discovered asteroid #1312 Vassar; K. Reinmuth discovered asteroid #1284 Latvia. The initial flight of the de Havilland Comet took place, the first jet powered commercial airliner. Goethe Link Observatory discovered asteroid #1751 Herget. An Atlas rocket launched from Vandenburg carried the OV1-86 cosmic ray telescope, OV1-12, used for solar flare observations, and OV1-11 into orbit. OV1-11 did not reach its planned orbit. USSR launched Intercosmos 16 from Kapustin Yar, which studied solar X-rays, for investigation of the ultraviolet and X-ray radiation of the Sun, and the influence of such radiation on the structure of the Earth's upper atmosphere. USSR launched Cosmos 1118 from Plesetsk, a Zenit-2M area survey photo reconnaissance satellite used for Earth resource studies as part of 'Gektor-Priroda' project. During the 6h 49m Mir EO-9-6 EVA, Mir cosmonauts Anatoly Artsebarsky and Sergei Krikalev completed assembly of the Sofora girder. Russia launched Soyuz TM-15 from Baikonur as Mir Expedition EO-12 with Russian astronauts Solovyov and Avdeev and French astronaut Tognini aboard, which docked with Mir on 28 July in its 405 x 410 km orbit. NASA's ill-fated Mars Observer spacecraft took its first photo of Mars, from a range of 5 billion km. 5. explore the structure and circulation of the atmosphere. Contact with Mars Observer was lost on 21 August 1993, three days before the scheduled orbit insertion, and was not re-established. It is unknown whether the spacecraft was able to follow its automatic programming and go into Mars orbit, or if it flew by Mars and is now in a heliocentric orbit. Subsequent analysis concluded the most probable cause of the mishap was a fuel line rupture during fuel tank pressurization, caused by fuel and oxidizer vapors leaking during the cruise phase through an improperly designed PTFE check valve to the common pressurization system. That leak resulted in an explosion that caused the rupture after the engine was restarted for a routine course correction. The rupture would have caused the spacecraft to spin uncontrollably, and would have made orbit insertion extremely unlikely. Although none of the primary objectives of the mission were achieved, cruise mode data were collected up to the time of the loss of contact. NASA's STS 93 (Columbia 26) landed after deploying the Chandra X-ray telescope into orbit, and conducting scientific experiments. 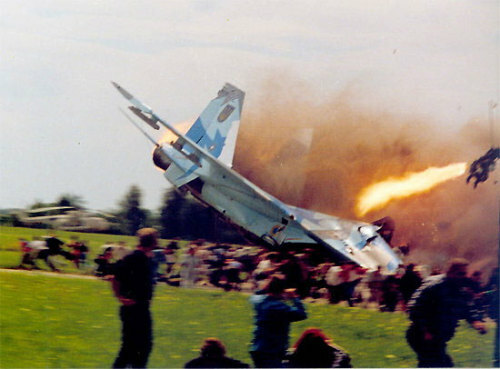 A Russian Sukhoi Su-27 fighter crashed during an air show at Lviv, Ukraine, killing 77 and injuring 543, 100 of whom were hospitalized, the largest air show disaster in history to date. Both pilots ejected to safety and were found guilty at trial.